Dodgers Blue Heaven: Blog Kiosk: 10/16/2017 - Dodgers Links - Walk Off! Blog Kiosk: 10/16/2017 - Dodgers Links - Walk Off! You can watch the Celine Dion version of Turner's massive homer here. BTW, Justin also got the game ball, as you can see in the photo on the right. This Day in Dodgers History: In 1949 the Brooklyn Dodgers elect to not renew the contract of Dodger President Branch Rickey. He would soon join the Pirates the following season. In 1985 Jack Clark of the Cardinals created one of my worst memories as a Dodger fan. 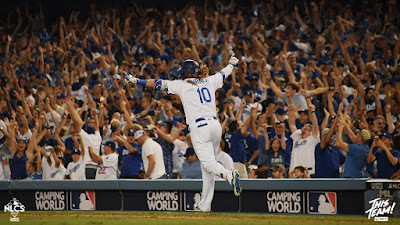 He belted a come-from-behind two-out, three-run home run in the ninth inning off of Dodger reliever Tom Niedenfuer to take the National League pennant. Watch it here if you must. Happy Birthday, Nick Cullop & Boom-Boom Beck! Via Cary Osborne at Dodger Insider; "In their words: Nine Dodgers take you inside Justin Turner’s moment." Hilarious. Per Mark Townsend at Big League Stew; "Yasiel Puig and bat flip critic Keith Olbermann make amends on Twitter." 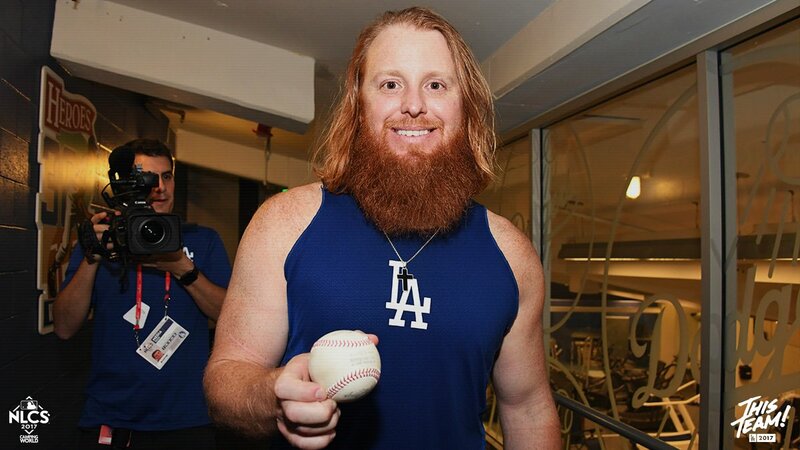 Via Arash Markazi at ESPN; "Meet Keith Hupp, the man who nabbed Justin Turner's walk-off homer." "When JT came up to bat I turned to my son and said, 'Hey, it was almost one year ago today that he hit that home run, wouldn't it be cool if he hit one and I caught it again?'" Hupp said. "During his first three at-bats I was envisioning the flight of the ball and he didn't hit a home run. "And in the ninth inning, he hit it, and it looked like it was tailing and going into center field and man, did I get lucky. I ran across as quick as I could and I reached out three or four feet and caught it." Via Ramona Shelburne at ESPN; "Tommy Lasorda delivers words of wisdom to Dodgers' Dave Roberts." "Everybody else tried to do this," Lasorda told Roberts during a quiet moment outside the clubhouse. "But you're doing it." Roberts smiled, bent down to shake Lasorda's hand and thanked him for the support. "Just trying to follow in your big footsteps," Roberts said.